Reprint. Translated from the Swedish This translation originally published: 2018. 'A novel of heartbreak told with intellectual rigor. It gripped me from first page to last. Fantastic! 'Alice Sebold, the author of The Lovely BonesWhen Ester Nilsson meets the actor Olof Sten, she falls madly in love. Olof makes no secret of being married, but he and Ester nevertheless start to meet regularly and begin to conduct a strange dance of courtship. Olof insists he doesn't plan to leave his wife, but he doesn't object to this new situation either . . . it's far too much fun. Ester, on the other hand, is convinced that things might change. But as their relationship continues over repeated summers of distance, and winters of heated meetings in bars, she is forced to realize the truth: Ester Nilsson has become a mistress. 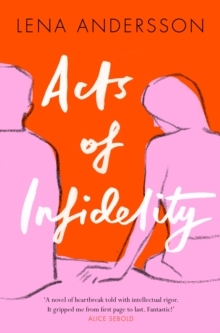 To read Acts of Infidelity is to dive inside the mind of a brilliant, infuriating friend - Ester's and Olof's entanglements and arguments are the stuff of relationship nightmares. Cutting, often cruel, and written with razor-sharp humour, Lena Andersson's novel is clever, painful, maddening, but most of all perfectly, precisely true.